The Formax FD- 38X Document Folder is a fully automatic folding solution for any business, church, school or print-for-pay center that demands quick and easy set-up. The FD- 38X folds exceptionally fast folding up to 20,100 pieces per hour! This document folder is capable of processing paper up to 18”x 12.25” giving it the flexibility to process a variety of paper sizes. A drop in feed system relies on three rollers for the dependable feeding of up to 500 unfanned pages. If a paper jam occurs, the Fault Detector cuts off the power to the motor and alerts the user to the problem. Fine tuning adjustment allows the precise setting for exact, crisp folds. The new 2.8” backlit LCD display and control panel makes the FD- 38X extremely easy to use. This folder features fully automated fold plates and AutoStack Stacker Wheels which provide a one touch set-up for the 18 pre-programmed fold settings or for choosing one of the 35 custom folds that can be stored into memory. The fold plates themselves are completely insulated to provide a quieter and safer operation. The Multi-Sheet Feeder allows up to 4 sheets stapled or unstapled to be folded at one time through the dedicated feed system with its own side guides and skew adjustment system. Operators can load up to 500 sheets in the hopper, select desired fold, press start and walk away to attend to other important tasks. 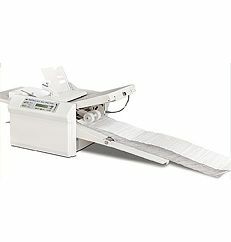 The FD- 38X can fold 500 sheets in as fast as two minutes and hold the folded pieces on its Telescoping Conveyor System. The large 2.8” backlit LCD display and user friendly control panel allows for untrained operators to walk up and start folding with little to no instruction. The FD- 38X advanced software allows for all standard fold types and paper sizes to be customized to meet your particular needs. If you have any questions or are interested in purchasing the Formax FD-38X Document Folder, visit us at SpiralBinding.com. We have great pricing on a full line of Friction Feed Paper Folders. Call us at 1-800-631-3572 for more information!